NEW Ski/Mountain House - Sleeps up to 20! 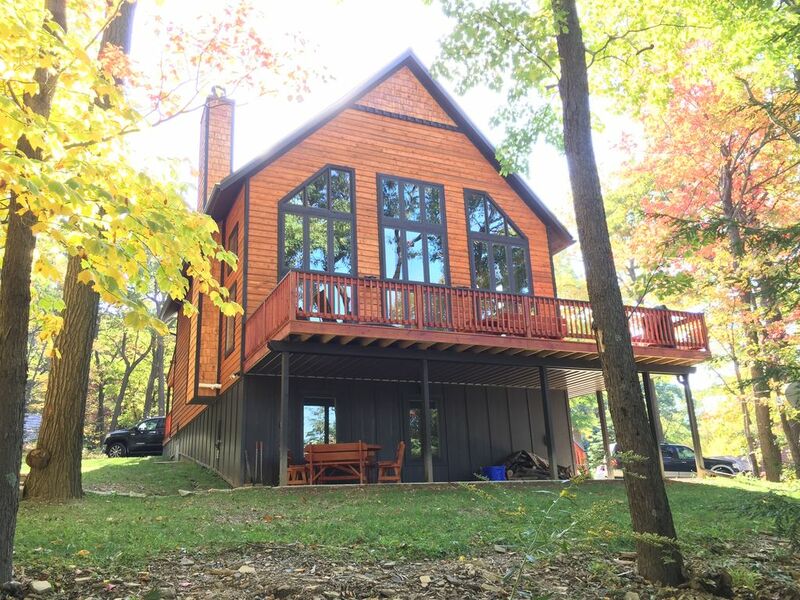 Located at an elevation of +2,900 feet, hands down The Midway Chalet is the premier vacation chalet on Blue Knob mountain and all of West Central PA! Located in the Little Valley section of Blue Knob ski area resort, our house is surrounded by the quiet of the mountains, but many activities of the local residents and vacationers. This brand new (2016) vacation rental has four (4) bedrooms and two (2) bunk rooms that will accommodate up to four (4) families or group of +/- 12 adults. The Midway Chalet features an open floor plan that includes a fully equipped kitchen with huge reclaimed wood top island, dining area for up the 20, and great room with a wood burning fireplace. The main level also includes a king size bedroom and full bath. The lower level features a rec room with wet bar along with 2 bunk rooms, an additional bedroom with full size bed and a full bath. The loft level features 2 queen sized bedrooms with a shared full bath along with a small loft reading space. Additional amenities include two (2) 60" Smart HDTVs, DirecTV, free WiFi and mud room for all your ski clothes, hiking gear, mountain biking gear or anything else you bring along. Keep in mind, we DO NOT rent to individuals under the age of 25 not accompanied by a family and this is a smoke free and pet free home. NOTE: For our summer guests, this mountain house does NOT have air conditioning. Our families have enjoyed skiing at Blue Knob since we were kids. The Midway Chalet allows families to enjoy this rustic vintage ski resort while relaxing in modern luxury. Slope Access - Walk to Midway Lift and slopes. A convenient +/- 3 hour drive from Washington, DC, Baltimore, MD and Philadelphia, PA. The Midway Chalet is just 2 hours from Pittsburgh! Minutes from I76 (PA Turnpike) and I99. One in kitchen, one in basement wet bar! Well equipped kitchen with granite countertops and large center island with prep sink and seating for 6. Our extended family of 20 spent Veteran's Day weekend & LOVED it! Matt texted me to check we had arrived safely, welcome us, & offer assistance with any needs which potentially arose. Clearly concerned about & dedicated to our comfort. There was a large TV in the finished lower level for the kids to play video games when it was too dark/cold to be outside and the adults could read, relax, and enjoy the fireplace without being disrupted by the noise. The kitchen was FULLY stocked with almost any pot, pan, utensil, device, etc. you could need. TONS of plates, bowls, & glassware. Blenders, griddles, crock pot, toasters, large stock pot, "Foreman" grill, etc. etc. Lots of spices & incidentals (baggies, plastic wrap, foil) which was very helpful. The island and table are very big & easily accommodated all of the cooks & kids simultaneously prepping, cooking, eating, socializing, & cleaning. If you have a large group - you know how helpful space in the kitchen/dining areas can be. The beds & pillows were comfortable. No complaints from 20 different types of sleepers - from age 3 to 81. Plenty of dry firewood to keep a fire going. NOTE: Definitely bring fire-starter logs and/or newspapers, kindling, etc as you're not necessarily in the woods to have dry kindling easily available. The place sleeps 20 but remember there are two rooms, each with 6 bunk beds, so number of beds weren't a problem, just number of separate rooms for couples to sleep. We packed our own, but there were numerous throw blankets throughout the house in case someone wanted to curl up in a chair or on the couch with one. Large groups should try to carpool as much as possible. Because some of our family is "local" we ended up having a good number of cars and parking is somewhat limited. But since we didn't venture out much, there was no need to repeatedly shuffle cars around. Overall - wonderful!!! Definitely recommend & would absolutely return. Or group (10-15, 70 year olds) has stayed in many different places over the last twenty plus years we have had our annual get together. Midway Chalet was by far the most comfortable. It is a beautiful, modern facility that still maintains a cabin like feel. It is well appointed and we did not find anything lacking; dishes, appliances, etc were all first rate. And all of the beds and furniture were comfortable for our achy old bodies. It's a little out of the way, but we thought that made it better. We'll be back next year. This was our first visit to the Midway Chalet. We enjoyed our stay very much. The large open room on the main floor has plenty of room for 20 people. The kitchen area is large and several people can be preparing food without being in each others way. Having 3 full baths is a plus. And having 6 bedrooms is very nice. The owners are very nice to deal with (we know them from other times at a different rental property). They always call during the visit to check on how things are going. And in the past we have found them to be very helpful if there are any problems ( there were no problems this trip). We had a family get together over the Fourth of July. We loved this house. Very spacious, comfortable and modern. Lance and Matt are great hosts and very attentive to ensure you have a wonderful stay. This was our second year in a row at this fantastic cabin on the Blue Knob. Our group of 12 had lots of space and enjoyed the riding in the area although the Saturday snowfall had us a little wondering why we left Canada in the first place!! The cabin has everything you could think of to make our stay comfortable and the big screen TV had the NHL and NBA playoffs in constant viewing. This was our third trip in a row! Great ski home with all the amenities for multiple families. We would recommend this home for multiple family vacations during all seasons. Great place which has giving us wonderful memories. Rates are subject to change until deposit is received. SERVICE FEE that appears on your quote is a HomeAway/VRBO fee that does not come back to the owner. It is retained by HomeAway. Starting October 2018 - We will be offering linens (Bed/Bath) for this property for a $150 fee.